Learn about the world under the ocean at aquariums in NY. Children and adults alike will be fascinated to see underwater life up-close when visiting New York aquariums. A great way to spend the day with the family is at an aquarium in New York watching fish, sharks, seals and more. See Sea Creatures Like You've Never Seen Them Before! Located on Coney Island this New York aquarium has a lot more than fish. Enjoy the touch pool where you can hold a sea star or pet a horseshoe crab. If the weather is nice, head outdoors to the sea cliffs where you can see playful otters, lazy walruses and energetic seals and penguins splash, swim and play in their mini habitat. Of course, don't forget the sharks! See these predators of the oceans up close and personal when you visit the huge tank that is home to reef sharks, sand tiger sharks and nurse sharks. This aquarium in NY is open 365 days a year! This charming aquarium in New York has a wide range of exhibits both indoors and out. Inside you can visit the Amazon Rainforest exhibit - a recreation of an endangered habitat filled with large river fish. Check out Poseidon's Treasure Room where you can see several varieties of unusual fish and marine life. See the Sand Shark Lagoon with locally caught fish and sharks that normally roam up and down the Atlantic coast. 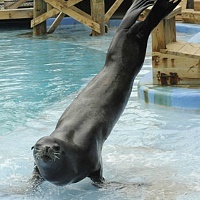 If the weather is nice, head outdoors to the Sea Lion Coliseum for an entertaining show from these clever creatures. Visit Otter falls and be delighted by these cheerful and playful animals. There is truly a huge amount of things to do and see at this NY aquarium. Open from 10am to 5pm year round except for Christmas Day. Discover a World Under the Oceans! For over 45 years the Aquarium of Niagara Falls has been fascinating people and educating visitors about the creatures that live in our oceans. A huge array of salt and freshwater fish can be viewed here including seahorses, piranhas, eels, sharks and more! 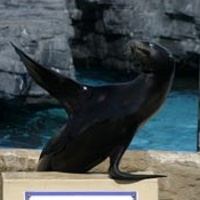 Watch a show put on by the aquarium's California sea lions or attend a training session and see how the animals are taught their impressive tricks. If you visit at the right time you can attend a penguin feeding or a shark feeding and watch these hungry creatures chow down. During certain seasons visitors can even feed seals themselves! 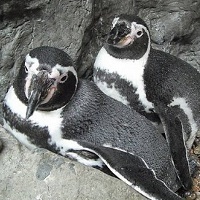 This fun New York aquarium is open year round from 9am to 5pm. A Favorite Stop on Family Road Trips! This tiny family owned and operated aquarium is fun roadside attraction in northern NY near the Thousand Islands. A great place to stop in if you're in the area, this aquarium has over 50 exhibits and tanks filled with all sorts of sea creatures. Fish big and small, crabs, lobsters, lionfish, anemones and coral from around the world are on display. If you'd like to see any of the fish fed, just ask! See their shark up close and personal - much closer than you could ever get in a larger aquarium. This aquarium even has two alligators! Open 10am - 5pm Monday through Sunday.